Baby steps. 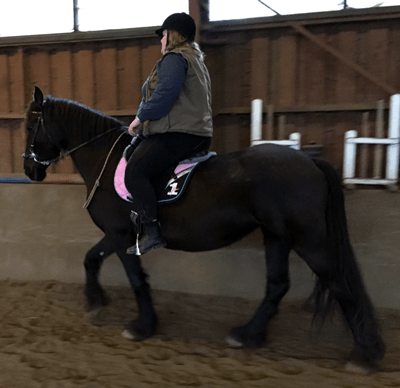 I’m still struggling with riding anxiety after my fall, even though my arm and shoulder are almost completely healed now. Actually I’m not certain that my humerus bone has finished growing back together but who cares when you have a titanium spike in there, keeping stuff together, right? 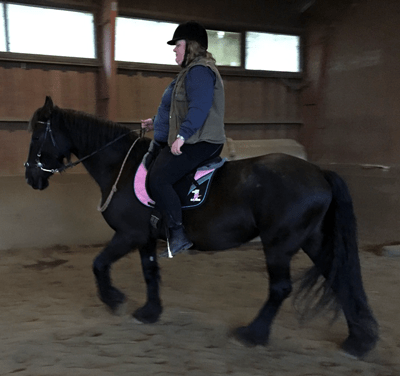 In order to push myself to work through this, I signed on for a one day course in cordeo riding at ridecare — that is, riding with a rope or cord around the horse’s neck rather than a bridle. I already ride bitless, so it’s not that big a step. 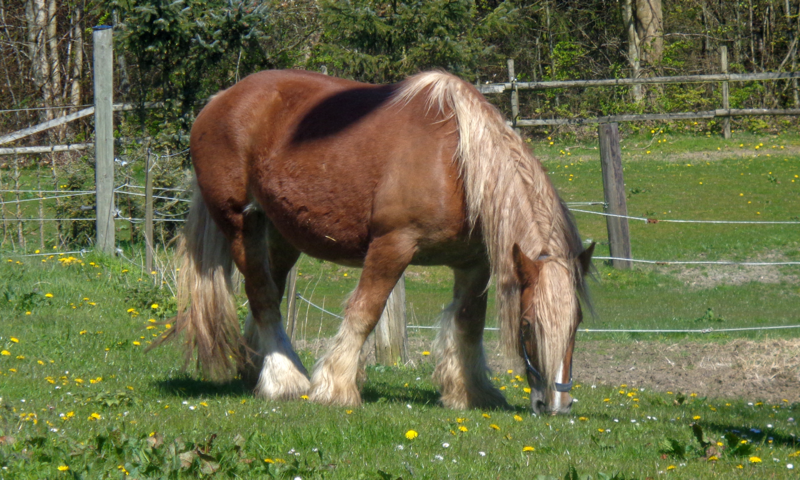 My old horse, Logan, loved the cordeo, the less stuff on his head the better. To Pilar, however, this is something new. Baby steps. 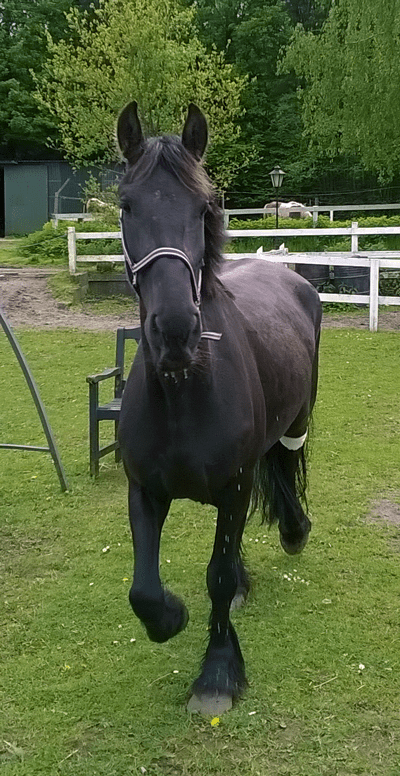 Pilar has reached the phase in her training where she seeks to put her head down and bend her neck nicely, but she still lacks the big back muscles building up properly. 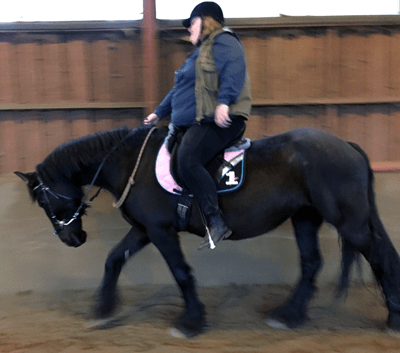 This causes her to drop behind the vertical often in order to briefly rest her neck, even when riding with long reins. We’ll get there. Baby steps. I’m way too overweight and I’m fully aware that most of my anxiety has to do with the fact that when I hit the ground there’s a hell of a lot of gravity not working with me but against me. I will change this. I will. Sure ain’t easy, though. Baby steps. As you can see from the pictures, we didn’t get as far as to remove the bridle altogether. Pilar loves to learn, but before I can ride her in the cordeo alone, she needs to get a bit better at picking up signals on the neck. I am going to ride her western style, one handed on long reigns, for a while, to teach her. She is an extremely attentive horse so I’m sure she’ll have this down pat in no time. Not so baby steps. This is Pilar last year, just a few days after she arrived with us in May. See the difference? She has built up so much muscle over the last ten months. Give me another year and we’ll have a fully armed and operational battle horse.